Saturday at 2016’s Division III Nationals in 2016 wasn’t kind to Air Force Afterburn. Air Force felt confident they could sweep through the pool and get to quarterfinals with an easy path. The reality of competing against other top D-III programs quickly set in, as they took a tough loss to Knox in the opening round and an injury to star sophomore defender Trevor Browning. Against Claremont, Air Force barely hung on to a 15-14 win. Goal line turnovers plagued them in the final round of pool play against Lewis and Clark. As they entered pre-quarters against UNC Asheville, the disparity between the two squads could not have been more different. “We were definitely deflated in the first bracket game,” said former Air Force captain Jake Johnson. Asheville, on the other hand, was fired up, coming off of two strong wins in pool play. Going down 4-0 is never the best way to start an elimination game at Nationals. Air Force couldn’t find a rhythm with its offense and Asheville could taste another win. Afterburn was flaming out fast in their first ever appearance at Nationals and no one seemed capable of saving them. Military service academies are not exactly renowned for producing strong ultimate programs. The rigorous training and work ethic it takes simply to be at a service academy don’t leave a tremendous amount of time to focus on building an ultimate team. Yet the ingredients for creating such a program in Colorado Springs was always there. Athleticism and the necessary discipline to adhere to the demands of weekly practices and workouts are all in abundance at the Academy. Air Force’s journey to national relevance has roots going all the way back to the early 90s, but the true journey to D-III Nationals began in the spring of 2013 when they picked up head coach Darren Mace. Mace was an east coast transplant who moved to Colorado and instilled a sense of desire and urgency in the program. “Darren had a positive, upbeat effect on everyone,” said Johnson. “Ultimate for us suddenly became a lot more serious with his wisdom and coaching.” Air Force attended its first D-III regionals that April, falling to eventual qualifier, Rice, in the 3rd place bracket. With the taste of even the possibility of competing at Nationals, Air Force returned each of the following seasons with a renewed sense of purpose to become a true contender. The story of Air Force was the same for many college programs: a promising returning cast of athletic players, a good fall season, and external factors beyond their control that plagued their ability to perform with their season on the line. Everything from injuries to the expulsion of several players from the Academy to bad weather in key games in the series to government sequestration in the fall of 2013 prevented Air Force from the becoming the program it seemed destined to become. 2015 was particularly tough. 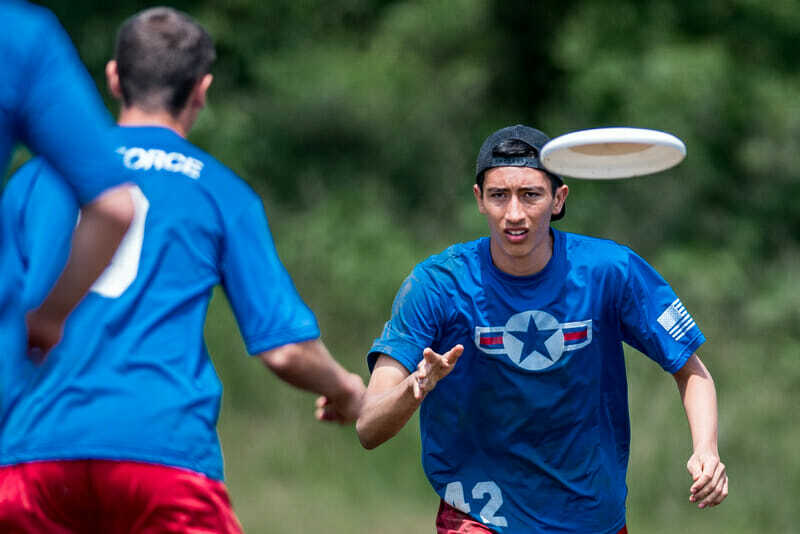 After earning a bid for the South Central region, Air Force was cited as an example of USAU’s poor bid allocation system for D-III ultimate. Having lost their best receiver Gavin O’Neill to a torn shoulder and missing their head coach, Air Force crumbled at Sectionals in the ultimate “I told you so” moment for those who were critical of their high ranking. Air Force’s 2016 campaign was a journey of redemption for the seniors in the program who both wanted to change the team’s image once and for all — and finally reach the elusive goal of a Nationals qualification. The system change was total: Air Force brought on assistant coach Carl Chan to avoid the situation they found themselves in at Sectionals. They began to consistently review game film, fundraised extensively to travel to competitive tournaments, and appointed a player to head up strength and conditioning programs for the team. Instead of relying on horizontal offense to isolate their most athletic players in one-one-one matchups, Air Force transitioned to a simpler vertical offense giving their handlers a chance to work their break throws and find a balance between natural athleticism and fundamentals. According to Johnson, “Air Force was the second most traveled team in the country and had the second most sanctioned games of any D-I or D-III team in the country.” With eight seniors and the memory of not qualifying for Nationals, Air Force finally exorcised their Series demons and qualified for Nationals. Back to Saturday afternoon in Winston-Salem. Air Force had a history of external factors not going their way. That all changed when, down 4-0 to UNC Asheville, the pre-quarterfinal round was postponed due to a thunderstorm. Play resumed at 7:30 AM the next day on fields turned into a Russian October quagmire. Air Force came into Sunday with a chip on their shoulder and nothing to lose. The mud aided Air Force’s excellent handler defense and slowed down the pace of Asheville’s offense. In the mud and under a threatening sky, they turned the 4-0 deficit into a gritty and emotional 12-10 victory. Air Force’s run was just beginning. In quarters, they set the tone early with a break on the first point against Carleton GOP. Air Force held the lead all the way to double game point with budding star Alan Villanueva picking up his final assist of the game. Air Force’s 11-10 win locked them in to a semifinal against the eventual national champion, Georgia College. Georgia College fielded arguably the most athletic handler-cutter duo at Nationals in Nathan Vickroy and Josh Bush. Air Force rose to the occasion, overcoming a small two point deficit in the second half, to yet again take the game to double game point. Air Force had thrown everything in their playbook at Georgia College, but the storybook run was over. Georgia College won it 12-11. But they had already shone a light on a very simple truth: Air Force was one of the most dangerous Sunday teams in the country. A first glance at Air Force in 2017 suggested a potentially underwhelming season for anyone who didn’t know the program better. The loss of eight seniors, for any team in college ultimate, is tough to overcome. But Air Force is not just any team. It took them several seasons of getting it wrong to finally get to Nationals, and, in their first appearance, they were just inches from the finals. Their sophomore class boasts a promising candidate in the player of the year race in Villanueva. A healthy Browning is a scary prospect for many D-III programs. In their zones, he is their hulking deep threat; the combination of Browning with an athletic three man cup has yielded excellent results. AFU’s record this season speaks for itself: tight losses to Oregon State, UC Davis, and Nevada-Reno are the only blemishes on an otherwise very promising resume. Air Force has yet to match up against the big east coast teams but crushed series nemesis Colorado College 13-6 at their home tournament earlier this month. Vertical offense remains Air Force’s bread and butter. Villanueva and Kainoa Chun-Moy are a tested handler duo: Villanueva’s ability to dominate in the deep space (which he is likely to do) makes him extremely versatile. Air Force is still not afraid to run a horizontal stack to take advantage of isos with a kill line. On the receiving end of Villanueva’s hucks are an army of underclassmen including their sophomore Nationals goal leader Matthew Moshea. For Afterburn, a return to Nationals is not good enough. Their ambitions as a program are high. “We are striving to increase our capability and play at a D1 pace, where we don’t have to rely on just a couple players,” said captains Mitchel Bie and Ben Protzman. Afterburn doesn’t have the benefit of a feeder program bringing in experienced ultimate players out of high school. The fact that they can aspire to perform at a level beyond that of a D-III program is a dangerous prospect for other teams in the division. What’s scary isn’t so much their current outlook as a program, it’s their high level of play with a roster consisting of only three seniors. Villanueva and Moshea are just sophomores. At the Stanford Open, Air Force was still able to perform with the absence of most of their upperclassmen. And all of the returners have that memory of Sunday at last year’s Nationals imprinted in their brains. “It was monumental for the program,” said Bie. “We had often used our lifestyle, academic burdens, and military requirements as an excuse to not really make it to the highest level.” They look to put those excuses fully to rest this postseason. Air Force is the #1 seed at this weekend’s D-III Midwestern Invite. Comments on "Air Force Flying High After “Monumental” 2016 Nationals Run"